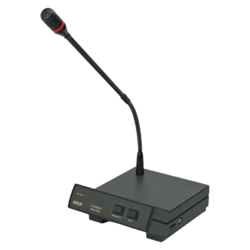 Pioneers in the industry, we offer ahuja conference systems from India. • The CMC-4100 Chairman and CMD-4200 Delegate Units have built-in loudspeakers and high quality sensitive electret condenser transducer mounted on 16" flexible goosenecks. The microphones of the units are equipped with a Ring LED indicator for easy visual identification of the unit in operation. Each unit has a headphone output with volume control. • The stylish, free-standing cast aluminium case has an angled facia incorporating the TALK switch which automatically mutes the internal speaker. • The Chairman Unit also has a non-lockable PRIORITY switch which interrupts the meeting with a chime tone and mutes the delegates' microphones. Both units have recessed volume controls for setting desired sound levels. Looking for Video Conferencing Systems ?